Abramowitz, Alan I. 2012. “Forecasting in a Polarized Era: The Time for Change Model and the 2012 Presidential Election.” PS: Political Science and Politics, 45 (4):. 18–19. Abramowitz, Alan I. 2013. The Polarized Public: Why American GovernmentIis So Dysfunctional. New York: Pearson Longman. Abramowitz, Alan I., and Saunders, Kyle L.. 1998. 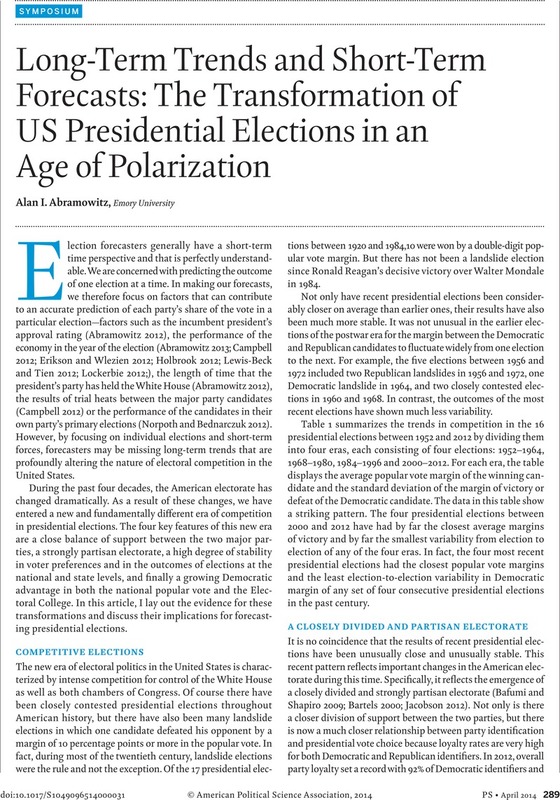 “ Ideological Realignment in the US Electorate.” Journal of Politics 60 (3): 634–52. Bafumi, Joseph and Shapiro, Robert Y.. 2009. “A New Partisan Voter.” Journal of Politics, 71 (1): 1–24. Bartels, Larry M. 2000. “ Partisanship and Voting Behavior, 1952–1996.” American Journal of Political Science, 44 (1): 35–50. Berry, Michael J., and Bickers, Kenneth N.. 2012. “Forecasting the 2012 Presidential Election with State-Level Economic Indicators.” PS: Political Science and Politics, 45 (4): 669–74. Campbell, James E. 2012. “Forecasting the Presidential and Congressional Elections of 2012: The Trial-Heat and the Seats-in-Trouble Models.” PS: Political Science and Politics, 45 (4): 630–.34. Erikson, Robert S. and Wlezien, Christopher. 2012. “The Objective and Subjective Economy and the Presidential Vote“ PS: Political Science and Politics, 45 (4): 620–24. Highton, Benjamin, and Kam, Cindy D.. 2011. “The Long-Term Dynamics of Partisanship and Issue Orientations.” Journal of Politics, 73 (1): 202–15. Holbrook, Thomas M. 2012. “Incumbency, National Conditions, and the 2012 Presidential Election.” PS: Political Science and Politics, 45 (4): 640–43. Jacobson, Gary C. 2012. “The Electoral Origins of Polarized Politics: Evidence from the 2010 Cooperative Congressional Election Study,” American Behavioral Scientist, 56 (12): 1612–30. Levendusky, Matthew S. 2009. The Partisan Sort: How Liberals Became Democrats and Conservatives Became Republicans. Chicago: University of Chicago Press. Lewis-Beck, Michael S. and Tien, Charles. 2012. “Election Forecasting for Turbulent Times.” PS: Political Science and Politics, 45 (4): 625–29. Lockerbie, Brad. 2012. “Economic Expectations and Election Outcomes: The Presidency and the House in 2012.? PS: Political Science and Politics, 45 (4): 644–47. Norpoth, Helmut and Bednarczuk, Michael. 2012. “History and Primary: The Obama Reelection.” PS: Political Science and Politics, 45 (4): 614–17.